Over thirty percent of all traffic on the web comes from mobile devices. This is a statistic that you must keep in mind if you have any interest in building a website these days, because if it’s not optimized for mobile viewers, you will pay the price (literally). Web designers have known about this trend for a while now, and their solution is appropriately referred to as responsive design (which you’re no doubt familiar with). The use of grids is so crucial to responsive design that, with the right grid plugin, you can make your site look stunning across all devices with ease. Over the course of this article, we’re going to dig a bit deeper into the importance of grids when it comes to web design, explain what grid plugins are exactly, and feature some of the best grid plugins out there. Why Are Grids Crucial to Responsive Design? When it comes to web design, grids are almost always there in one fashion or another, and that’s no coincidence. Their structure is pleasing to the eye and they serve to establish a visual rhythm, but beyond that, grids enable designers and developers to present information in an easily digestible and appealing fashion. This simplicity plays an important role in keeping visitors interested, by presenting them with multiple choices without overwhelming them. When it comes to responsive design, grids are an ideal building block, since they can be scaled without breaking the overall structure of a website. To understand how this works, examine the screen on which you’re reading this article. If it’s a standard home computer, the layout will be horizontal and wider than it is taller, which gives developers and designers a generous helping of real estate in which to make their vision pop to life. This layout (which was the norm before mobiles were ubiquitous), of course, poses a problem when it comes to smaller screens. The elegant solution which responsive design brings to the table is to build websites from the ground up using a mixture of flexible grids (which can be resized according to the resolution of each viewer), images, and media queries. In this scenario, grids are the building blocks upon which a mobile-friendly web environment is built. Grid plugins do the heavy lifting when it comes to making sure your content is mobile-friendly by creating a system of flexible grids for your content to reside within. All you have to do is provide the content and make sure that the media you pick displays properly across all devices in order to keep your site looking sharp. So without further ado, let’s move onto our selection of the best grid plugins available today for WordPress users! We’ve split our picks into free and premium sections. “Display posts in grid layout without coding” is how Content Views introduces itself (it’s even a part of their WordPress.org title) and that’s an accurate if incomplete overview of what this plugin offers. Using this plugin, you can choose to display your content in a responsive and organized fashion with the default grid option, or as a scrollable or collapsible list. Display any kind of content within grids (or lists) using shortcodes. You can choose the content manually, automatically display the latest posts, or use specific criteria such as categories, author, and status. Enables you to preview how your posted content will look once it’s organized without leaving the configuration screen. Select which fields or meta-data (thumbnails, titles, content, etc.) will be shown to readers. Content Views also offers a premium version with some additional features, such as Pinterest-like layouts and support for WooCommerce products. While this plugin’s developers may not have pulled any muscles when coming up with a name, Post Grid does succeed in delivering a visually unique grid experience. It is of course fully responsive, and features a wide variety of default grid styles you can try out if you don’t want to create a unique design using its configuration options. 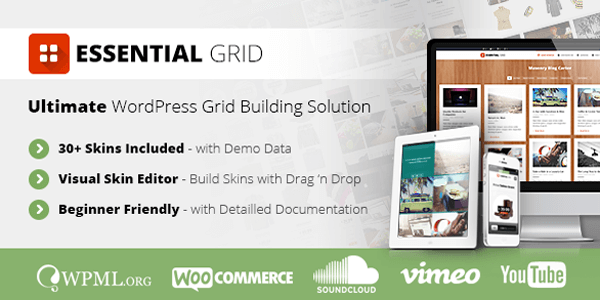 Several different default grid configurations which support all kinds of WordPress content. The shape, width, and height of your grids can be manually customized. Enables you to mix multiple post types within a single grid seamlessly. Includes social sharing buttons for all major platforms. PickPlugins (the team behind Post Grid) also offer a premium version of this plugin, which supports products from WooCommerce, Easy Digital Downloads, and WP eCommerce. You’re already familiar with Post Grid, but what about WP Ultimate Post Grid? While this plugin does offer some features that the aforementioned tool doesn’t, we’ll leave it up to you to decide whether it’s worthy of the ‘ultimate’ moniker. As you might imagine, this plugin is meant to format your posts into responsive grids using a variety of styles which you can choose from. Enables you to use posts or any other kind of content as the components of your grid. Includes multiple default styles such as the classic grid, another that features excerpts of your articles, and boxes with hover animations. Create multiple grids and choose which ones you want to place within your pages using a convenient button placed in the text editor. Readers may filter out your published content using category filters which are preset by you, this can be done either with buttons (whose style is customizable) or dropdown lists. Enables you to break down grids into multiple pages or enable infinite scrolling. While our previous picks focused on systems that could seamlessly display multiple kinds of content, Final Tiles Grid Gallery is all about letting images do the talking. The admin panel adheres to the material design style, making for a visually gratifying experience on both the back and front end – something many developers tend to overlook. The plugin uses an algorithm to determine the optimal size of the display for each image on your grid, which attempts to stay as close to the original as possible. All galleries are resized using smooth animations when the display resolution is modified. Optimized to take advantage of hardware acceleration in mobile devices to display smoothly across all platforms. Thorough documentation (spanning over 52 pages with visual references) is included alongside the plugin installation files. This one is pretty straightforward – Pinterest’s unique visual style needs no introduction, and Masonry Layout simply enables you to introduce this style to your WordPress website. Whether you use it to display your posts, galleries or online products, this visual style is sure to keep your readers interested. Enables you to create a Pinterest-grid (you specify how many columns you want to display) using whichever kind of content you choose, and insert it anywhere on your site using shortcodes. Set specific categories for your grids, which enables your visitors to search through your archives in an easier fashion. Your grids can be ordered using whichever criteria you prefer or sorted automatically (according to publication times). The premium version of Masonry Layout also includes the traditional endless scrolling functionality that can be seen on Pinterest, and multiple additional layouts to customize your grid further. Essential Grid is meant to be an all-in-one grid solution for all kinds of websites – from blogs, to product sliders, galleries and portfolios. It’s packed with dozens of pre-made layouts and skins, but also offers a powerful configuration tool to make each grid your own. Over 25 different predetermined layouts, including boxed, full-width, tables, product, and video grids. 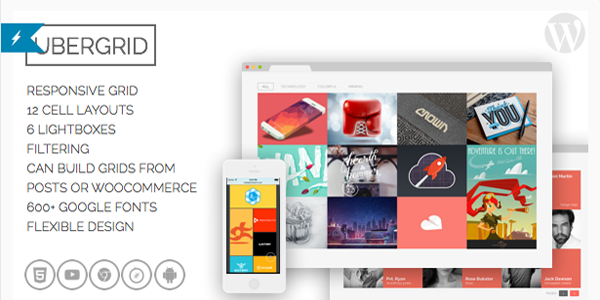 Includes layouts specifically designed for integration with WooCommerce stores. 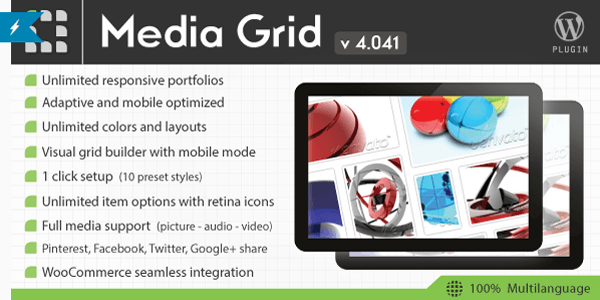 Supports integration of Youtube, Vimeo, and HTML5 videos, SoundCloud clips, and iFrame content into your grids. Powerful customization tool enables you to modify each aspect of your grids (the default size of your displays, pagination, spacing, filters, fonts, animations, etc.) and preview how they’ll look from within the dashboard. Enables you to export or import custom layouts, as well as metadata. This plugin will set you back $26 for a regular license, and you can check out a live preview (which showcases all the layouts included with your purchase) on their official website. If you’re in the kind of field where the fruits of your labor are intended to be appreciated visually, a gallery portfolio is a must these days. They come in all shapes and sizes – from the hectic to the minimalistic – but they all have one thing in common: they’re all meant to display your work in its full glory. Media Grid steps up to the challenge here, being the only plugin in our list designed solely to create image grids that can serve as a visual portfolio, or simply to display regular galleries in a more effective manner. All galleries are fully responsive and can be based on one of the plugin’s ten predetermined layouts or your own custom design. Includes a drag-and-drop visual builder, which allows you design your own grids and shows you exactly what will be displayed once they go live. Supports all media types, including video and audio. Optimized for better SEO results with its own pagination system. Integrated support for WooCommerce products. Media Grip will cost you $19 for a regular license, and you can check out its official video documentation series on their DailyMotion page. UberGrid, our finl pick, is meant to be another one-stop solution for layout organization using grids. It’s got all the features you should expect by now if you’ve been reading our list closely, plus a myriad of pre-made layouts, support for multiple content types, and heavy customization options. That being said, it does have several features which set it apart from the competition. It’s designed with small screens in mind, but also includes on-the-fly box size adjustments for viewers. Grids can be either automatically created from a pool of content or customized to include only the posts you choose. Customizable lightbox feature which enables you to open grids within one. Support for Google Maps integration. Optimized CSS3 animations for all supported browsers. Hundreds of custom fonts included thanks to the integration of Google Fonts. A regular UberGrid license costs $19. You can see the plugin in action on its live preview section or take a look at their demo videos. Making websites display properly across all devices is a complex issue that causes a lot of headaches in the world of web design, made only more troublesome by the rapid rate at which new mobile devices and operating systems are developed. Grid plugins are by no means a perfect solution to the problem, but they certainly can make your life easier. All you have to do is pick a plugin depending on which kind of content your website is focused on and experiment with different layouts until you find the most attractive option. Then you can sleep soundly knowing your that website won’t be showing up broken on most devices. What’s been your experience with WordPress grid plugins? Let us know in the comments section below! Hello, thanks a lot for this. If you allow me, I was partially disapointed by Media Grid that doesn’t look responsive that much (but maybe I didn’t enough try), and that’s a bit complicady to set (didn’t get the internal logic of the designer). In the other hand, I discovered The Grid from Themeone. This is a pure jewel. Rich, responsive, evolutive, beautiful (but they all are), and intuitive (to me). And their support is fastest than light. Michelob, I’ve recently installed The Grid by Themeone on a Divi site, and I can’t get the Justified grids to display correctly. Have you found this when using The Grid on your sites? But can anybody tell me the advantages of using a grid system with a Divi or other theme with or without the Divi builder and also how you would implement the combination? Absolutely agree with Martin. What’s the plus if you have DIVI? Same thoughts here… doesn’t or shouldn’t Divi offer these customizable grid based layouts and designs out of the box? Please explain. Yes Martin, I was wondering the same thing, I use Divi, would a grid plugin do something Divi doesn’t? Some of these plugins offer more grid variations than what you can do with Divi by itself. Sort of like some of the best slider plugins have more options than our native slider. I haven’t personally tested all of these plugins with Divi but maybe that would make a good post in the future? True. But that’s why i suggested verticaly grouped colums/divs for future divi releases. It would allow one to ‘mimic’ grid layouts. Featuring real grid layouts would perhaps be even better though. Even so $20-25 isnt much for these premium plugins, the options they offer are incredible. If I use DiVi, do I still need Grid Plugin? You don’t need one, but if there are features included in some of these plugins that you want then by all means give them a shot. As far as I know, there should not be any compatibility issues. Personally, I use Posts Grid on most of my blogs. Though, you can add Genesis Grid plugin in list too for Genesis theme users. Absolutely agree with Martin and Luc. How does it work in combination with DIVI. What are the advantages ? I had used Content Views Premium but it dramatically slowed down page load times. I had to delete it. Too heavy a plugin but it is a beautiful piece of work. I was looking for a grid display for my site on a custom homepage for my posts since my theme did not have a grid built into it. I chose No 2. Post Grid after playing with the first one on the above list. Post Grid suited me best since it offered styles to manage the display of each entry of the post. I did not look into the others on the list. Perhaps when I have more time. What is the advantage of these plugins over the opportunity to us Portfolio or Gallery option in most ElegantThemes? I have used Essential Grid in combination with Divi. The main reason to use one is the extra visual options and content source options. So you can make a grid with special hoover effects and custom made places for titles, comments etc. The options are endless. What about loading times using this Gallery grids? In response to adding a grid plug in, when using Divi….. if it aint broke dont fix it!…… Plug ins just seem to add more problems for me than anything! I used Content Views Pro with Divi. It is perfect combination. I can display posts by custom filters in beautiful layouts easily, among some Divi components. l think its a real shame this isn’t something the developers have added to the Divi theme yet. If a module was developed & added with the same sort of options as Essential Grid, it would make it the best theme on the market. come on guys, get a move on ? grid plugin is a great one. I use it on all my blogs.